Beautifully appointed in secluded grounds overlooking the picturesque town of Westport. 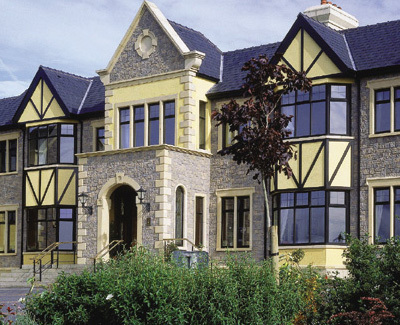 Beautifully appointed in secluded grounds overlooking the picturesque town of Westport, Knockranny House Hotel enjoys unrivalled views of Croagh Patrick, Clew Bay and the Atlantic Ocean. This luxurious Victorian style property hosts a variety of public areas featuring many fine antiques. Fresh flowers and roaring open log fires in winter create a warm and welcoming ambience while the service is friendly and attentive. Bedrooms and suites offer luxury, comfort and space in equal measure with warm colors and tasteful furnishings. A recent expansion saw the addition of 13 luxurious suites including a magnificent presidential Suite, a Penthouse Suite and a number of beautiful Master Suites and Courtyard Suites - all of which are incredibly spacious, designed and finished to the highest international standards.The restaurant La Fougere, is renowned for excellent cuisine with an emphasis on fresh seafood and the finest local ingredients complimented by a selection of fine wines. Spa Salveo, open since 2005, is the largest of its kind in Ireland featuring a vitality pool surrounded by a thermal spa suite, with a brine inhalation room, aromatherapy grotto, herbal sauna, scented steam room, hydrotherapy body stations and monsoon shower. 12 treatment rooms include a serail mud chamber, hammam massage room and a dry floatation room. Fishing, horse riding and hill-walking are all available close by, while there is the excellent parkland golf course in Westport or the challenging links courses at Connemara, Carne and Enniscrone.